Heavenly Seagrass Palm Leaf Drapery Fabric Heavenly Seagrass features a tropical design of palm leaves in serene shades of green and teal. This multi-purpose fabric would work well for a variety of applications including window treatments (such as drapery panels and roman shades), cushions and throw pillows, and light-duty upholstery applications such as dining room chairs or upholstered headboards.Spot clean with water free dry cleaning solvent. Trembling Aspen Pierside Woodrose Cotton Fabric Trembling Aspen is a warm and whimsical fabric featuring a beautiful tree design in a painterly style. Colors include shades of orange, purple, pink, very pale minty green, tan and brown. This 100% cotton printed fabric is eye-catching and very lovely. The fabric has a nice hand and drapes well, making it an excellent choice for window treatments such as roman shades and drapery panels, but would also look really great in other home decor applications, especially duvet covers and throw pillows. 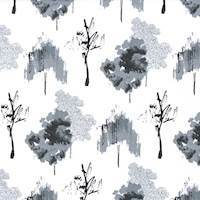 Lost-Lake-Riverpark Fog Gray Cotton Fabric Lost-Lake-Riverparks is a serene-looking fabric featuring a riverbank scene in a watercolor style. Colors include shades of grey and white. 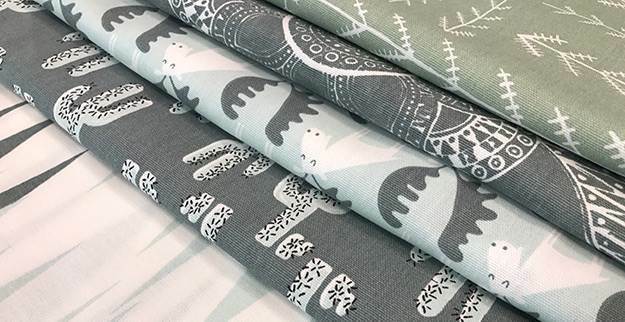 This 100% cotton printed fabric is refreshingly modern, yet casual and pretty. The fabric has a nice hand and drapes well, making it an excellent choice for window treatments such as roman shades and drapery panels, but would also look really great in other home decor applications, especially duvet covers and throw pillows. 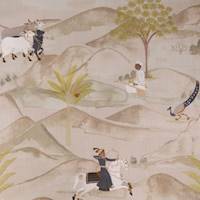 Punjab Linen Persian-Look Drapery Fabric This fabric features a large-scale scenic design with a Persian art look. This exotic-looking fabric is in shades of natural, green and gray. This fabric would look great as drapery fabric or pillow fabric. The design is printed on a 100% cotton base cloth. 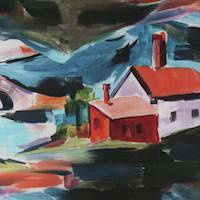 Essex Multi Painted-Look Drapery Fabric This truly original drapery and pillow fabric features painted-look design in shades of red, blue and green. This fabric would look great as drapery fabric or pillow fabric. The design is printed on a 100% cotton base cloth. Cora Saffron Folk Tree Print Upholstery Fabric Cora Coal Folk Tree Print Upholstery Fabric. This lighter upholstery weight fabric is also suitable for drapery. Uses include any upholstery project, sofas, chairs, dining chairs, pillows, certain types of window treatments, handbags and craft projects. 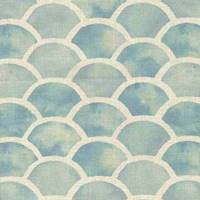 Amelia Mineral Blue Upholstery Fabric This fresh fabric features palm or banana leaf theme in serene shades of light blue, cream and off-white. Perfect for a modern or tropical feel, beach home, or spa-themed bathroom. Suitable for drapery or curtain fabric, including all kinds of window treatments, drapes, curtain panels, shades, valences, and more. Also suitable for pillow fabric, bedding fabric, and other home decor applications. Cora Coral Folk Tree Print Upholstery Fabric Cora Saffron Folk Tree Print Upholstery Fabric This lighter upholstery weight fabric is also suitable for drapery. Uses include any upholstery project, sofas, chairs, dining chairs, pillows, certain types of window treatments, handbags and craft projects. 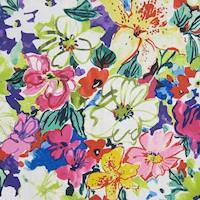 Trisha Multi Sketch Floral Upholstery Fabric Trisha Multi Sketch Floral Upholstery Fabric This lighter upholstery weight fabric is also suitable for drapery. Uses include any upholstery project, sofas, chairs, dining chairs, pillows, certain types of window treatments, handbags and craft projects. 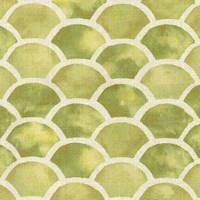 Sandpiper Lemongrass Watercolor Bargello Upholstery Fabric Sandpiper Lemongrass Watercolor Bargello Upholstery Fabric. This lighter upholstery weight fabric is also suitable for drapery. Uses include any upholstery project, sofas, chairs, dining chairs, pillows, certain types of window treatments, handbags and craft projects. Sandpiper Mineral Watercolor Bargello Upholstery Fabric Sandpiper Mineral Watercolor Bargello Upholstery Fabric. This lighter upholstery weight fabric is also suitable for drapery. Uses include any upholstery project, sofas, chairs, dining chairs, pillows, certain types of window treatments, handbags and craft projects. 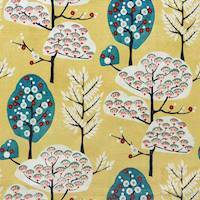 Cora Saffron Folk Tree Print Upholstery Fabric Cora Saffron Folk Tree Print Upholstery Fabric. This lighter upholstery weight fabric is also suitable for drapery. Uses include any upholstery project, sofas, chairs, dining chairs, pillows, certain types of window treatments, handbags and craft projects. Lotus Italian Denim Slub Canvas This printed cotton fabric features a contemporary dotted / petal design in off-white and blue. This fabric would make gorgeous drapes or bedding and could also be used as cushion fabric, bedding fabric, headboard upholstery or other lightweight upholstery. The base cloth is 100% cotton with a slub texture. Hand wash cold with mild detergent. Printed in the U.S.A. Spirit Regal Slub Canvas This printed cotton fabric features a an oriental toile design in gray and off-white. This fabric would make gorgeous drapes or bedding and could also be used as cushion fabric, bedding fabric, headboard upholstery or other lightweight upholstery. The base cloth is 100% cotton with a slub texture. Hand wash cold with mild detergent. Printed in the U.S.A.
Sycamore Ink Drapery Fabric by Premier Prints Gray and off-white 100% cotton printed fabric featuring a watercolor-look tree design. Ideal as drapery fabric, pillow fabric, cushion fabric, light-weight upholstery, crafts (such as bags, aprons, etc) and much more. Printed in the USA. 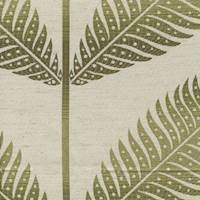 Sago Fern Green Palm Leaf Upholstery Fabric This unique fabric features green palm or fern leaves on an ivory or beige background. Ideal for both upholstery and drapery applications including window treatments, pillow fabric, upholstery fabric and more. 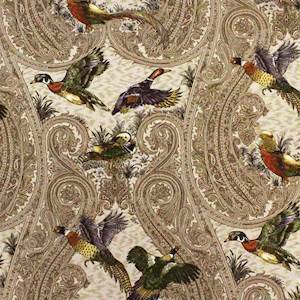 Gamebirds Heritage Hunting Themed Cotton Drapery Fabric This drapery weight fabric features a hunting theme design with a variety of gamebirds including duck and quail on an ornate floral paisley background. 100% cotton and a nice drapery weight. 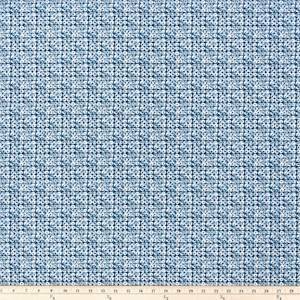 This fabric is ideal for drapes or roman shades in a home office or den. This fabric is also a nice weight for throw pillows and other home decor applicatons. Domino Italian Denim Drapery Fabric by Premier Prints Blue 100% cotton printed fabric. Ideal as drapery fabric, pillow fabric, cushion fabric, light-weight upholstery, crafts (such as bags, aprons, etc) and much more. Printed in the USA.